The Quran states that men and women were created to be equal parts of a pair. Muhammad said that the rights of women are sacred and that they are the “twin halves of men”. Considering women in Britain received the right to vote, inherit and own property thirteen centuries later, Muhammad’s campaigns were both radical and revolutionary. Muslim women gained full ownership over their money, while husbands had the responsibility to provide for them even if their wives were wealthier than them. Women had the right to divorce instantly on returning the dowry, something other religions don't allow. One duty enjoined upon them was that of education. Early Islamic history saw the establishment of Muslim women as scholars, politicians, businesswomen, jurists and doctors. Fatima al Firhi founded the first university in 859 in Fez, Morocco; Razia al Din ruled the Delhi Sultanate in India in 1236; Umm Darda, a scholar from Syria, taught imams, jurists and even had the 5th Umayyad caliph who ruled from Spain to India as her student. In fact some eight thousand accounts of Muslim female scholars have been documented, many of whom in addition to theology and jurisprudence, were skilled in calligraphy and philosophy, women who not only contributed to their society but actively shaped it. The fruits of Muhammad’s reforms are as visible now as they have been throughout history. Today, Muslim women in Britain are achieving positions of status and respect as police officers, lawyers, entrepreneurs, medics, social activists, MPs and peers in the House of Lords. Remaining true to the ideals cemented 1,430 years ago, Muslim women were and still are role models for future generations. 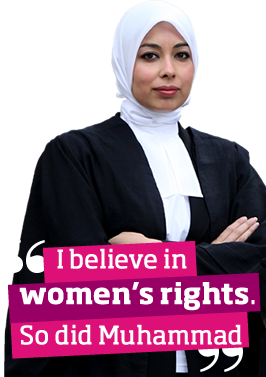 “Working as a barrister at a leading human rights firm, I often get asked the question: how are you able to reconcile your choice of profession with Islam’s views regarding the role of women? The question usually stems from the false presumption that Islam sees women as unequal to men. This could not be further from the truth. My answer is that there is no conflict to reconcile. Rather my choice of profession is entirely in sync with, and indeed promoted, by Islam. If you study the rights and status of women in Islam, it is easy to conclude that the laws and practices put in place by Prophet Muhammad were, and still are, revolutionary. He brought recognition to their rights in both the private and public spheres in a society which inflicted the worst kinds of degradations on women. His reforms continue to be revolutionary in that they do not regard men as being the comparator or the benchmark by which equality is measured. Whilst Islam promotes the notion that men and women are spiritual and intellectual equals, it also gives value to the differences between the sexes as strengths rather than weaknesses. From an Islamic perspective, women are regarded as being particularly suited to engaging in the legal arena. This is not only because we are intellectual equals to men, but also because we were more likely to introduce a level of empathy and thereby give recognition to the human dimensions of justice. I certainly try to adopt this approach in my work.